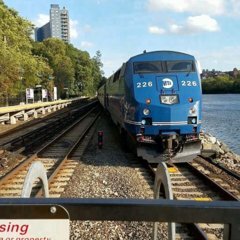 MTA Metro-North Railroad President Catherine Rinaldi has announced that effective Sunday, April 14, Metro-North is opening New Haven Line trains for travel between Fordham and Manhattan. The change means railroad customers will be able to access an additional 96 weekday trains for travel between Fordham and Manhattan that previously had been off-limits, more than doubling existing service of 93 daily Harlem Line trains. On Saturdays, 67 New Haven Line trains will now be available for such travel, bolstering the existing 83 Harlem Line trains. On Sundays, the railroad is adding access to 65 New Haven Line trains to the existing 63 Harlem Line trains. During off-peak times, when waits can be longest, the changes mean service between Fordham and Manhattan will operate roughly four times an hour instead of twice an hour. Previously, New Haven Line trains stopped at Fordham only to enable travel between Fordham and points north, in Westchester County and Connecticut. Customers at Fordham seeking to travel south to Grand Central or Harlem-125th Street, as well as customers at those two stations seeking to travel to Fordham, were directed to Harlem Line trains. Southbound New Haven Line trains stopped at Fordham to discharge passengers only, and northbound New Haven Line trains stopped at Fordham only to receive passengers. The move comes after Metro-North completed a $15.1 million renewal of the Fordham station, which included doubling the width of the northbound platform, building a new entrance at Webster Av. and E. 193rd St., rehabilitating the historic station building, adding permanent artwork, larger stairways, and new entrances to Fordham Plaza, which was simultaneously rebuilt and reconfigured by the NYC Department of Transportation. In the east Bronx, the MTA is planning to build four New Haven Line stations in the East Bronx along the rail line to Penn Station. On the line that serves Fordham, Metro-North recently doubled off-peak and weekend service to Melrose and Tremont, which began as a pilot program in October 2016 and was formalized a year later. As a result of this policy change, revenue from the sale of train tickets between Fordham and Manhattan, which previously had gone entirely to Metro-North, will now be split between Metro-North and the State of Connecticut. They should do this for 125th as well, though it is not as crucial. Also, I think it helped that the CT transportation commissioner was actually Ms. Rinaldi’s predecessor at Metro-North. If anyone in Connecticut was able to understand the situation, it would be Giulietti. That 10 minutes can be 5-6 minutes with common sense improvements, as detailed by Alon Levy. The cranky old man in me wants to complain about having to deal with Fordham Prep kids for 20 minutes, but I don't think my trains will get much more crowded and it'll double options for plenty of people. Long overdue and a great change. By the time trains get to 125th it seems like 90% of conductors are pretty much done with the train and don't even blink at people who get on. Extending the policy there could make sense and capture some more revenue - or those people who hop on will just take the subway now that they'll have to pay. When Rinaldi said “The rule about boarding at Fordham had a long history", was he referring to a dispute about how fares would get split between NY and CT? Or some other ridiculous political grudge match? The history mentioned dates back to the early 1900’s when today’s Harlem and New Haven lines were two different railroads that were each separately owned. It dates to 1841. The original stop in the Bronx was Woodlawn.